This is an 18 x 24 acrylic marbling. I initially marbled the orange flowers on this painting. I then marbled this two more times to tone down the orange. I like the effect of this. It reminds me of petals floating in the water hence the name. 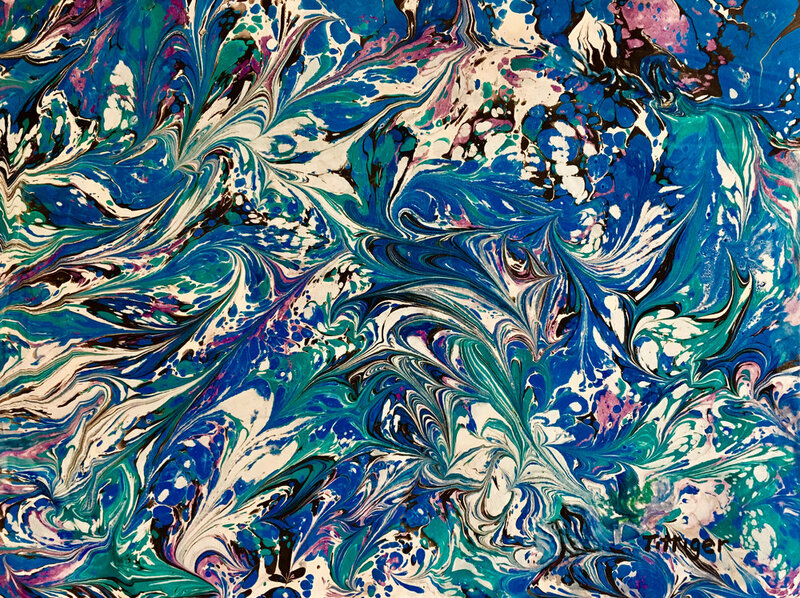 This is an 18 x 24 beautiful acrylic marbling of different shades of blues. Reminds me of a swirling ocean. This is an 18 x 24 acrylic marbling. The two large flowers seem to balance out the picture with all the colors on the opposite side. This is an 18 x 24 acrylic marbling. It is an abstract of numerous tulips. This is an 18 x 24 acrylic marbling that reminds me of a peony. This is an 18 x 24 acrylic marbling. The colors are a subtle design that reminds you of a rainy morning.